During the inaugural B2BNext conference, Hill & Markes presented on how automation is changing their customer engagement. This article recaps the session from Chicago and highlights how this family-owned business used an ecommerce chatbot to lower costs, increase sales and improve customer satisfaction. Hill & Markes located in upstate New York is positioned as the one stop shop for foodservice disposables, janitorial & office supplies, and industrial & farm stand packaging – servicing corporations, universities, and hospitals. However, up until about a year ago, this 112-year old family-owned distributor didn’t have an ecommerce platform. Flash forward present-day and they are now leveraging multiple technologies to automate and enhance their customer service. Providing extraordinary customer service experiences has been the epicenter of the Hill & Markes business model. The strong customer relationships they’ve created over the generations are the basis for their success. And as part of that, their customers have historically relied on the personalized fashion of calling directly into the company – resulting in heavy call volume through the Hill & Markes customer service channel in terms of order placements, inquiries, product support, etc. In the beginning of 2017 with a newly implemented ecommerce platform, their clientele was not up-to-speed or trained on the functionality of the site. Therefore, they moved back to the “old fashion way” and called in all orders and inquiries. The customer service team was struggling with the workload of managing emails, calls and order entry. Resulting in laggard times responding to each customer and providing that highly-valued customer service with answers and information in real-time. The first order of action Hill & Markes took was to ensure their customer service and sales teams were 100% comfortable with the features and functionality of their ecommerce platform. Training took place on their staging site where every customer service and sales rep tested and tried with creating shopping lists, sending messages, etc. – anything a customer might do on the site. Since 50% of their orders are generated through customer service, ensuring full adoption among this team was essential. Once customer service was fully immersed in the capabilities and functionalities of the site, they created a customer training program to educate their clients. When customers called in, customer service reps would walk them through the ecommerce process until they were comfortable to do so themselves. Training videos on YouTube, as well as pre-corded webinars were also created and shared. One of the primary questions coming into the customer service team was in regard to an item being out of stock. Since they shied away from promoting inventory volume and displaying “out of stock” online, they also wanted to decrease the number of phone calls questioning inventory. 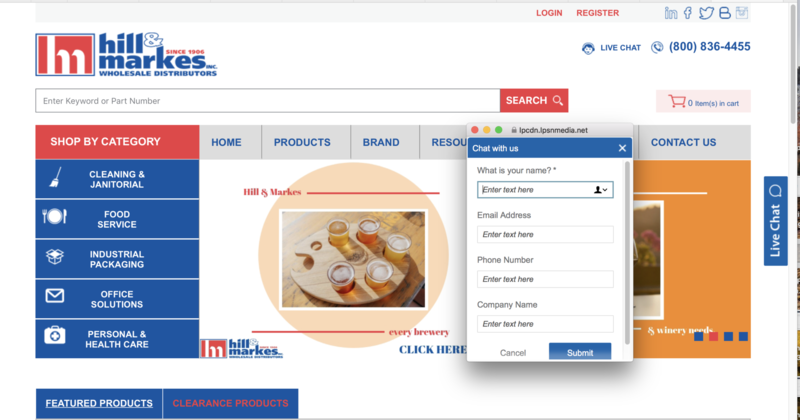 Hill & Markes saw this as a great opportunity to test and leverage a live chat feature online. Selecting the AI-powered messaging platform, LivePerson, they are now able to communicate with their B2B buyers online and in real-time. Empowering customer service reps with conversational marketing tools to cross-sell or upsell should inventory be out of stock. The ecommerce chatbot feature also allows customer service reps to engage with more than one customer at time, reducing lag time between serving clients. Results: Hill & Markes has seen a drastic drop in call volume and has been able to track 20% of total revenue through ecommerce. What’s next for Hill & Markes? Taking inspiration from retailers, Hill & Markes is looking to provide customers with updated and real-time delivery status. Similar to what Amazon is rolling out with Map Tracker– allowing customers to watch a dot on the screen similar to monitoring an incoming Uber or Lyft driver. Stay tuned as we learn what widgets they implemented and lessons learned. The post How a 112-year old distributor transformed their business with an ecommerce chatbot appeared first on Get Elastic Ecommerce Blog. Ebook - The Future of Commerce is Now Are You Ready?